For the first time since mandatory statewide restrictions were imposed, Californians missed Governor Jerry Brown's water conservation target in January. On average, local water suppliers delivered 17.1 percent less water than in January of 2013. That pulls the cumulative savings rate below the governor's mandatory threshold of 25 percent. 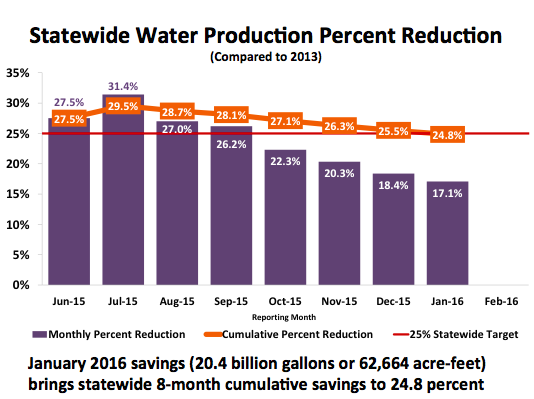 It's the sixth straight month that water savings has fallen off among Californians. Hover over the dots to see if your district met its water saving goal. Despite that trend, the state's top water regulator is happy with the overall drought response from consumers. "Californians have risen to the occasion as never before," said State Water Resources Control Board chair Felicia Marcus in a conference call with reporters. The state is holding local urban water suppliers responsible for cutting monthly water use by 25 percent compared to the same month in 2013. The statewide conservation rate peaked in July, when consumers cut their use by 31 percent compared to the base year. State water regulators had expected a drop in conservation during the winter months, when most homeowners have already reduced outside watering and have to find additional savings indoors. Outside watering was likely further reduced by wet weather in January, particularly in Northern California. The parade of mild storms prompted TV meteorologist Paul Deanno to start keeping count. He tallied 11 separate rain systems that blew through the Bay Area in the first 22 days of January, essentially a storm every other day for three weeks running. Then nature seems to have shut off the tap and most of February has been dry throughout the state. Regulators concede that conservation numbers are not likely to improve when the February numbers come in. "February's been a bear, with no disrespect to bears," Marcus told reporters, referring to the recent dearth of rain and record high temperatures. 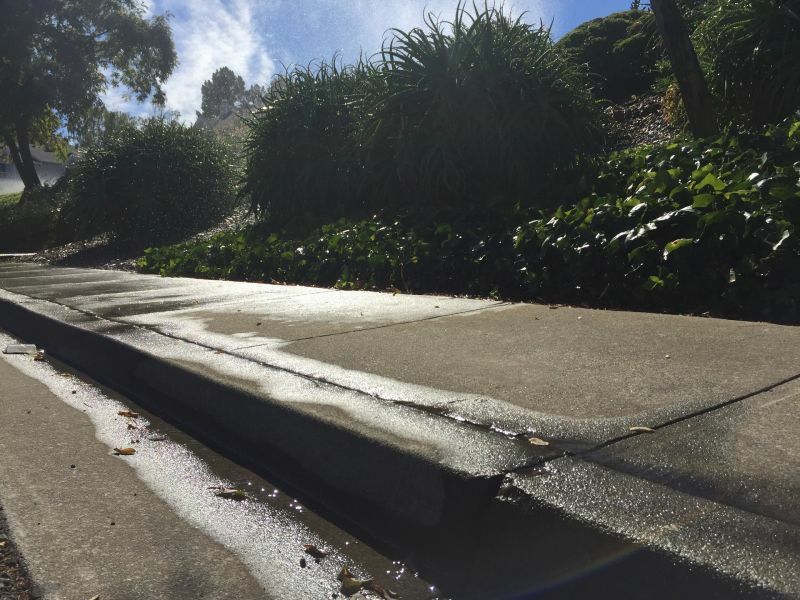 "When its hot and dry, people want to turn on their sprinklers." If there was a silver lining in January, it was that on a per-capita basis, urban consumers used an average of 61 gallons per day, the lowest figure reported in the eight months that officials have been keeping records. The daily per-capita figure for Bay Area residents was 49.5 gallons, bettered only slightly by Central Coast consumers. By comparison, when Australia suffered its recent decade-long drought, urban residents managed to squeeze per-capita water use down to near 35 gallons per day. Despite the steadily dropping conservation rate, Max Gomberg, senior scientist with the water board, says officials have achieved 96 percent of the overall savings goal set for the drought emergency period ending this month. "We're very close," Gomberg told reporters. "We are where we wanted to be." The governor's original drought restrictions were intended to run through the end of this month, but Brown has already extended the rules into the fall of 2016, with some modifications. Regulators will review those rules in April and could make further adjustments based on the water supply outlook at that time.